A Milwaukee, WI based artist, I am most known for my colorful contemporary art on canvas, paper and board. Using a variety of large brushes and various tools, I apply paint with quick gestural strokes. As an artist who was schooled in abstract expressionism, my work continues to be rooted in that as well as in impressionism, and other influences from the modern art movement. Whether titled or untitled, I encourage you to interpret each piece of work from your own perspective, experiences and/or memories. Sometimes it’s a color that will trigger a deep and meaningful response in someone, sometimes a line or a combination of gestures or marks that spark the same response. Much like we build our lives, one moment at a time, my paintings are built layer upon layer, all of which work to influence the outcome. As I create an interaction between myself, the paint and the painting, my work becomes a journey of discovery and wonder. I have a BFA in Fine Arts and am a member of the Southeast Chapter of the Wisconsin Visual Artists, The Museum of Wisconsin Art, Walkers Point Center for the Arts, the Milwaukee Art Museum and MARN. 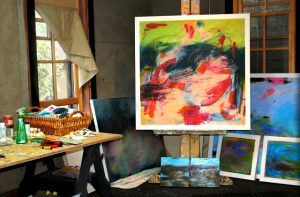 As an exhibiting artist, I have won numerous awards for my contemporary and abstract paintings and my work is in both private and public collections.